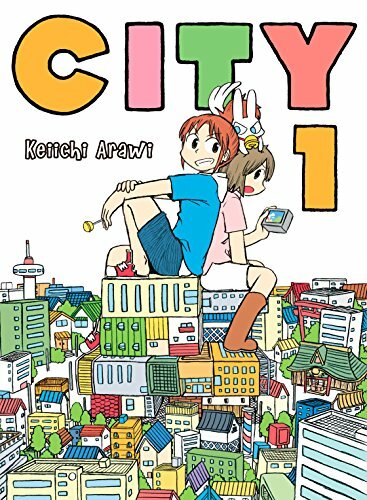 City 1 is a surreal fast-moving episodic Sunday Comics-style manga. Nagumo (20) doesn’t have her rent money. She tried to double her money by playing the horses and lost. Her landlady, called the Granny, is insistent. Niikura, Nagumo’s best friend cannot loan her the rent money. Nagumo goes through many schemes trying to pay her rent. Granny is a street brawler (literally). City 1 contains twelve 12-page stories. All involve city life and build on each other. Some are ironic, some are humorous but all do not seem like traditional manga. I’m not sure if the problem is in the translation or me not understanding Japanese culture well enough despite my worship of Studio Ghibli and mecha anime. Do Japanese really touch the gills of a shiitake mushroom or rub an eraser to relax? City 1 is clearly meant to be a madcap comedy. It fell short of that for me. However, tastes vary so I’ll give this comic 3 stars. Thanks to the publisher, Kodanska Comics, and NetGalley for a copy.